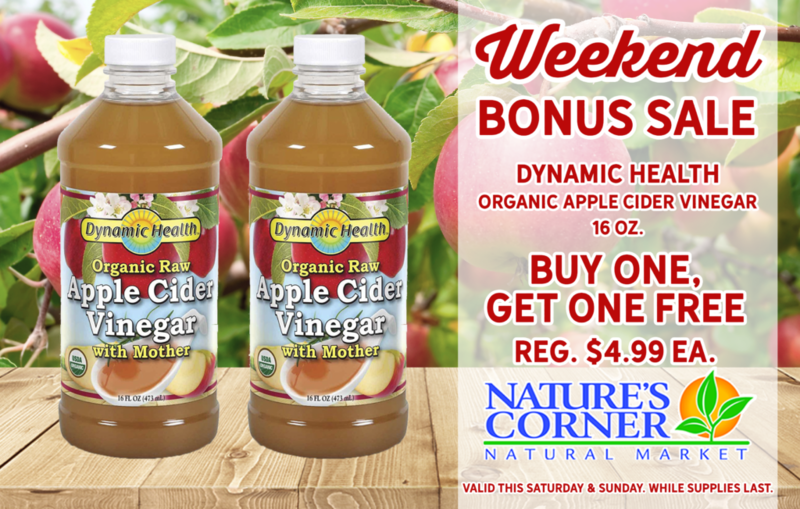 This weekend, Saturday, February 9th – Sunday, February 10th, Dynamic Health Organic Raw Apple Cider Vinegar (16 oz.) will be Buy One, Get One FREE! This organic apple cider vinegar contains “The Mother” of vinegar that is formed naturally in unpasteurized vinegar. Add a zippy, delicious and healthy flair to salads, vegetables and most foods or can be taken diluted in water or your favorite beverage. It’s also vegan and gluten-free! Come on in this weekend and pick up TWO for the price of ONE! Have a great week everyone.